WHEN THE STORY about the Danish Cartoons broke (the year after they were first published), I was in Zanzibar, Tanzania, where Michelle and I had just got engaged. It was interesting to watch the global events unfold from the perspective of a Muslim country, where the outrage was palpable. Many of the people we spoke to expressed their disgust at the disrespect shown by those cartoonists and we agreed that their motive could not have been anything other than malicious and provocative. But as the violent response by Muslim fundamentalists evolved, so too did my sympathies. If there weren't a cause for such cartoons then, there surely was one now. I drew this cartoon in the Dar es Salaam airport and on our flight back, nervous that some extremist might see it and take offence or worse: my life! My paper's sub editor Dave Chambers received the cartoon circumspectly, but agreed to print it (without running it by the editor first) if I would remove the Arab insignia on the wings, which I did. He later said that had he noticed that the pilot was a Muslim he'd have had him retouched too, but I'm glad he didn't, because the cartoon is about a radical Islamic attack on the freedom of expression and is not intended to be a criticism of Islam in general. 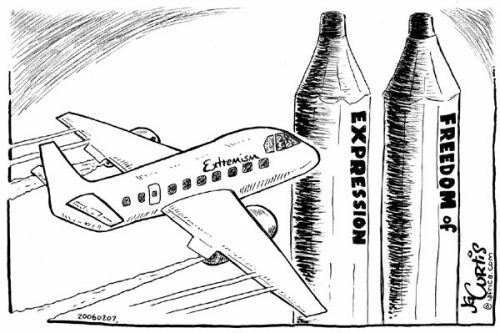 JOHN CURTIS' CARTOON juxtaposes the extremist Islamic response to the Danish cartoons depicting Muhammad with the events of 9-11, by employing the iconic image that was emblazoned into the world's memory four years earlier of an airliner careering towards the twin towers.